The apartment had everything you need, even tooth paste. The location is perfect. The stairs are a challenge with suitcases but good for fitness. L'appartement correspond tout à fait aux photographies publiées sur Booking. L'hôte était très accueillant et disponible. L'emplacement de l'établissement est excellent . Отличное расположение, очень чисто, уютно! Замечательно встретили, сразу отвечали на письма-запросы! Очень рекомендую! Philippe nous a proposé l'appartement du 5ème étage en nous disant que l'escalier était facile à monter. Il avait raison. L'appartement est propre, coquet, lumineux. Tous les appareils fonctionnaient bien et il y avait énormément d'espaces de rangement. Le plus grand atout de cet appartement, c'est sa situation en plein cœur de la vieille ville et tout près du lac. Lock in a great price for Boël 5 – rated 9.4 by recent guests! The apartment has 1 bedroom and 1 bathroom with a bath and free toiletries. A flat-screen TV is featured. Stade de Geneve is 2.4 miles from the apartment. The nearest airport is Cointrin Airport, 4.2 miles from Boël 5. 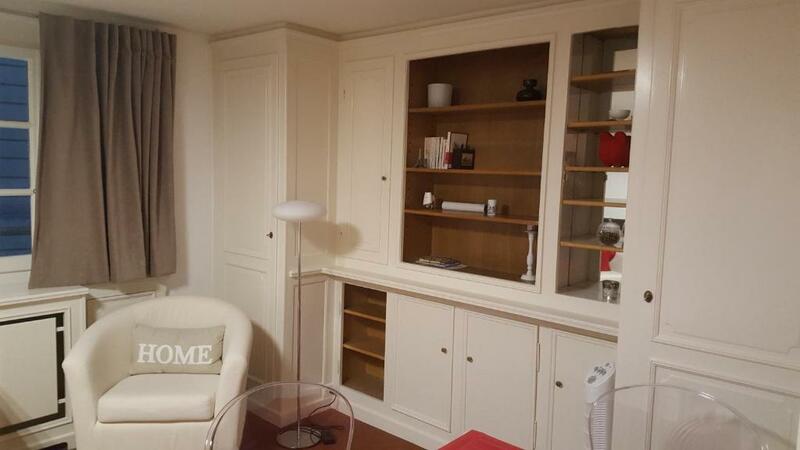 뀐 Located in the real heart of Geneva, this property has an excellent location score of 9.6! When would you like to stay at Boël 5? This apartment has a dishwasher, seating area and toaster. House Rules Boël 5 takes special requests – add in the next step! Boël 5 accepts these cards and reserves the right to temporarily hold an amount prior to arrival. Please inform Boël 5 of your expected arrival time in advance. You can use the Special Requests box when booking, or contact the property directly using the contact details in your confirmation. The mattress was bit hard for me . Noisy streets at night. Owner decided to paint the bedroom inside the morning we arrived, which dominated the smell during our visit. Opening windows at night to refresh the air were no option (cold and noisy). Also central heating and warm water were not available the first day/night. A refund of 1 day was promised if we decided to stay but never delivered. The flat was on the fifth floor and was reached by a very steep helical staircase. This was not a problem for us as we are still mobile but it would be virtually impossible for someone with mobility issues. This should have been mentioned when we booked. It was very noisy outside every night.